How to ... remove seats when the rails are rusted. After reading a couple of threads asking how to remove their seats because they are stuck or rusted in I decided to show you how I removed them to change the seat rails. Since the seat does NOT move forward or back you will see it is IMPOSSIBLE to get a good grip on the nut with a 13mm socket wrench or key . Most of the nuts are so rusted, even if you could grip them they will surely strip. So instead of getting frustrated with them here is how I remove these..
Front Bolts are the easy ones... using the dremel disk cut through the fronts of both nuts. Just make a front cut where you can insert the large flat tip screwdriver. Once the cut is done insert the screwdriver in the cut and give it a good wack with a hammer... the nut WILL snap after a couple of good hits. 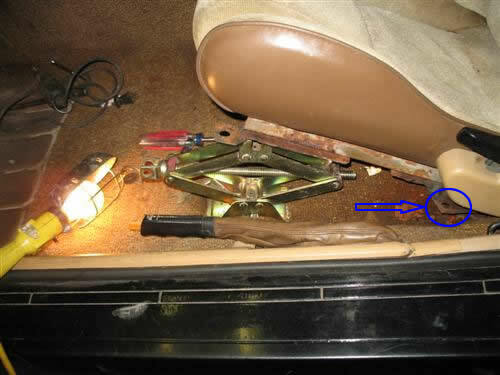 Once both front nuts are snapped off use a car jack to lift the front of the seat up high in the air. this will give you dremel access to the outer nut. Do the same.. cut a line in the side of this nut so you can insert the screwdriver to give it a hit. 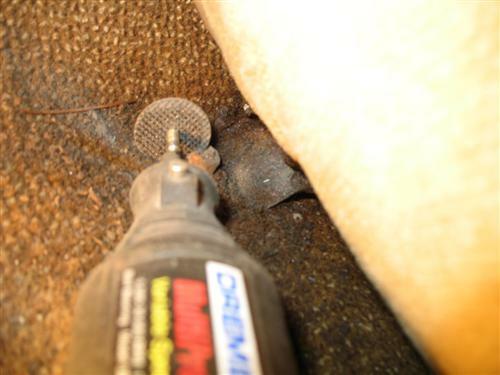 You can see that once the seat in jacked up you also have good dremel access to the hardest one to reach in the back. Make sure you cut in the side of this nut to insert the screwdriver. 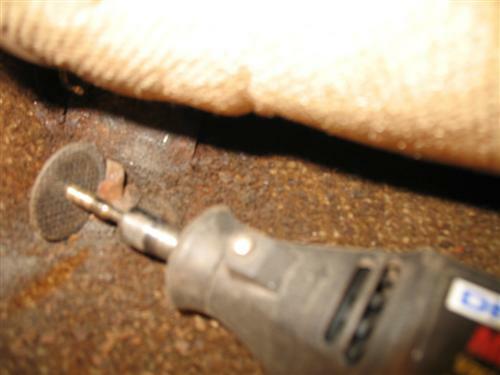 I have done 8 seats with this method and the bolts can be reused to hold new seat rails down. Try not to go through too much of the bolt with the dremel as you cut through the nut ..... you will have to re-weld new ones if you do. Once the nuts are cut tug on the seat and .... VOILA !!! You get a "+" from me. I had to do this with my Indy as the sunroof had been leaking and the seats were rusted solid to the floor. This is my forth northern Fiero .... and so far I had to do this for all of them .... I bought new seat rails for the black widow this week ... they are going have a generous coat of grease on the tracks and nuts ... this to prevent further headaches ..... I wonder if there is something else I can use to prevent this ??? infinitewill --- yep but if the rails lock up again still is a PIA to remove the rear ones.... any thought on what should be put on the rails to keep them nice and slippery??? I used your procedure this past weekend; it worked!!! a big + for you. lol i just posted a question asking how to get my darn seat out looks like i should have hit the archives first!! ill b tryin this soon as my dremel charges.!! Lol, your "cut a slit and then stick a screwdriver in it" method in it is how the oral surgeon pulled my wisdom tooth with the curved roots. First she cracked the crown off, then "dremeled" a "plus sign" into the tooth, and with three screwdriver twists, she was able to break the tooth into quadrants and yank the pieces out. I used this for my drivers side seat the seat came out just fine, but the studs in the frame broke right off. any ideas on how to replace them???? 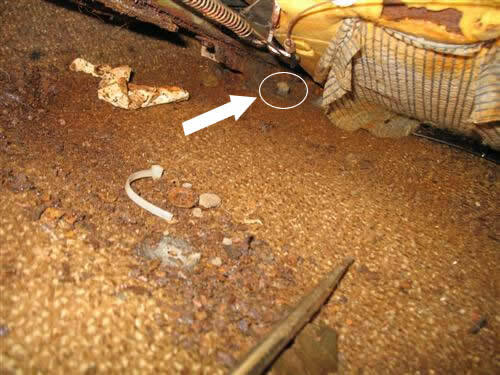 Just curious as to how your floor pans looked. Had to do the same process (after reading your method) on my 87 GT. Was this on a car you were scrapping? 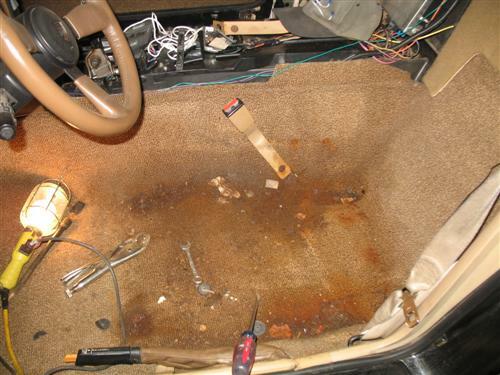 If your floor pans were rusted how did you repair? Thanks! Great write-up! I too live in the "rust belt" area of Canada and had to contend with this issue. It's interesting how we have to get creative and remove our rusted hardware. I think any weekend TV car shows should do a few episodes of how Northern people work on their cars. I mean, lets see them try to remove control arms, cradles, etc with regular hand tools and no time lapse photography!